AN INSIGHT INTO WHAT IT TAKES TO SEE RED. 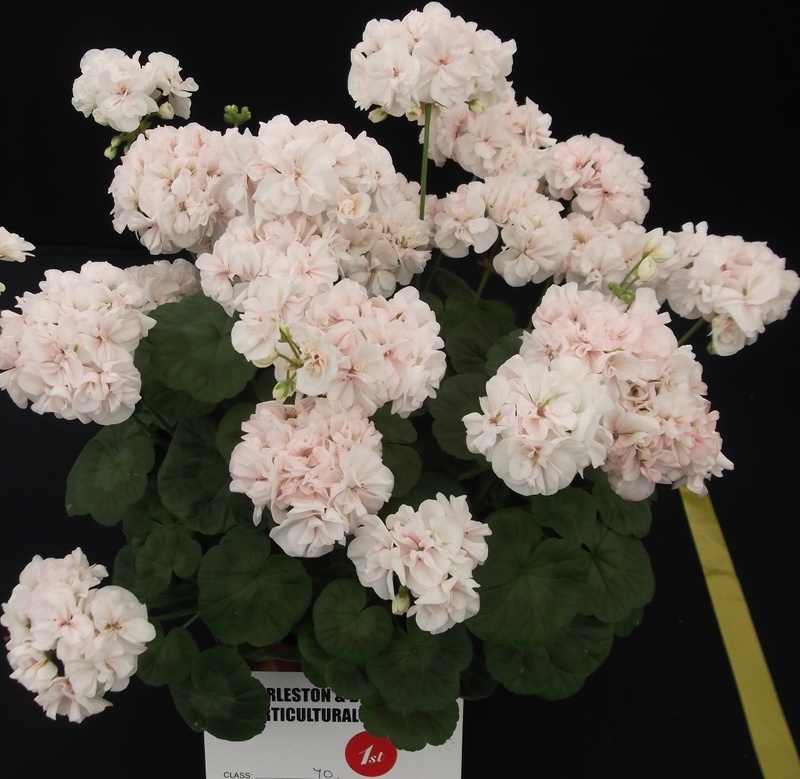 I hope by now that I have whetted the appetite of fellow growers regarding Showing Pelargoniums, so here are some tips to help you along the way and to give an insight into just what is required to achieve a winning exhibit as I see it. 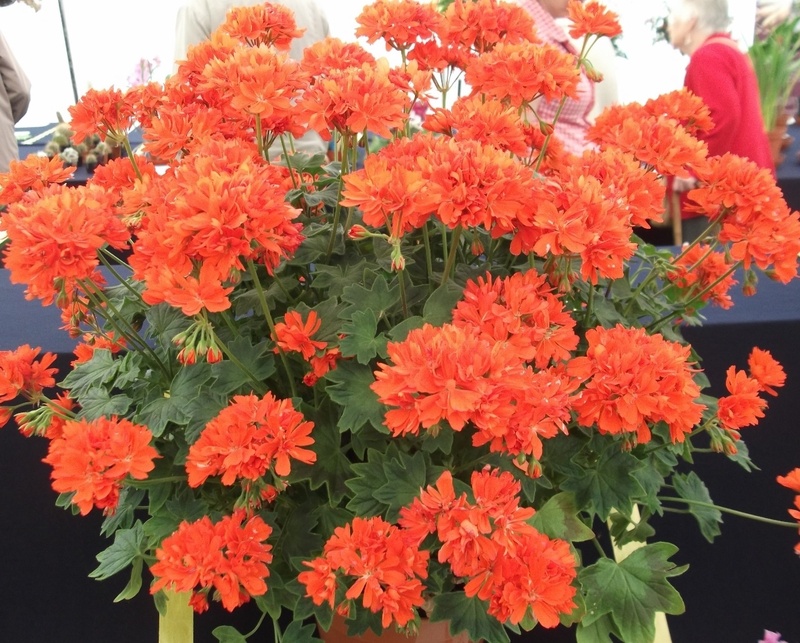 If you are a novice or just someone who wants to go down that route think about joining an affiliated Pelargonium Society, Horticultural Society, or Garden Club if you are indeed lucky enough to have one locally. This is a good way to learn more about the plant with like minded folk and get the opportunity to take part in their shows. It is also a good source to add plants to your collection by buying or swapping with the members. 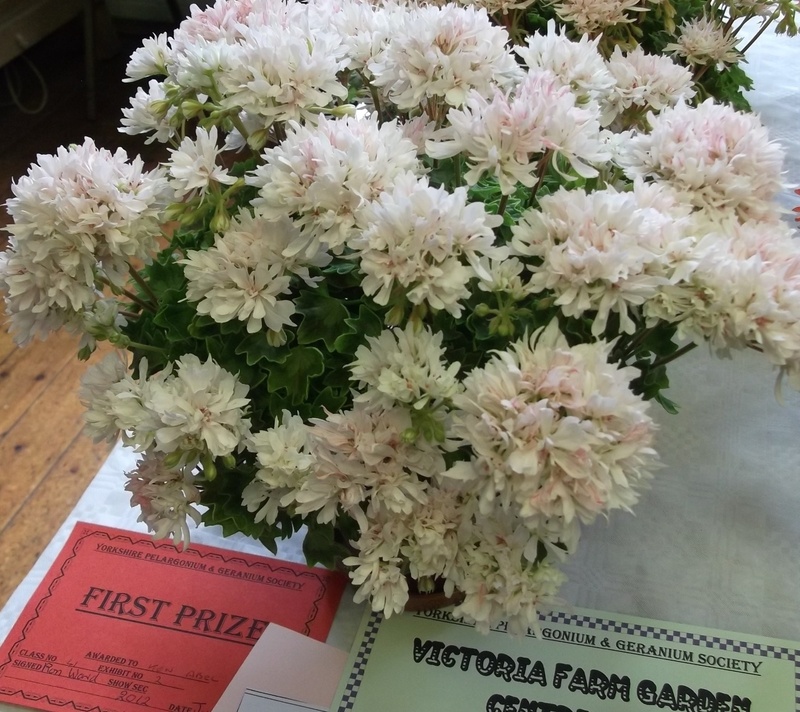 What the judges are looking for is a well grown plant which has a rounded shape to it. The growth should be nice and compact with plenty of flowers, so it is best to select cultivars to grow that are known to fit this criteria for the best results. 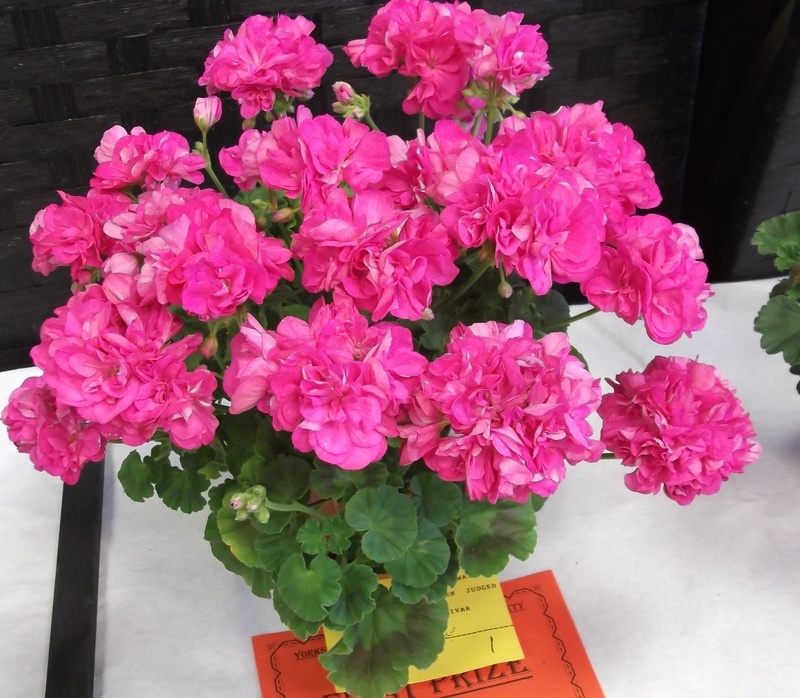 To help understand how a judge will reach their verdict on what a plant is awarded, the maximum total that a Pelargonium can achieve is 100, unless it is a multi-pot class where an extra 10 points per plant can be awarded for uniformity and overall effect. 6. unclean where dead and yellow leaves have not been removed. 4. leaves disproportionate to the size of plant, an example being a miniature plant in a 3.5" (9cm) pot the leaves should be the right size and any too big will lead to a points deduction. Care has to be taken under this heading when growing Miniature and Dwarfs as there is a height restriction on the foliage of 5" and 7" respectively, which is a measurement from the top of the pot. The penalty for this used to be NAS (not as scheduled) however now judges are asked to use some leniency and see it as a fault where points are deducted instead. C) Flower heads 45 points. It is important to take note of the following or you will be heavily penalised. It is a good idea to remove dead florets and seed heads, but please note that seed heads can be left on Species. A plant with following buds will show that it is fresh and has got potential to keep on producing flowers, so points will be deducted for the lack of these. Marked florets are also regarded as a fault, so take care to make sure that plants destined for the show bench are not standing under an open window in case of rain (it has happened to me) as this really does discolour flowers especially if the sun them comes out. I also net my doors and windows to keep the bees out and away from any open flowers as the damage they do soon becomes apparent. This is where the major points are to be had so if it works out right that a plant comes into full flower at least a week before a show they will look fresh and clean and collect full marks that are on offer in doing so. D) There are 5 points on offer for Staging and Display so to achieve full marks here make sure that all pots and saucers are clean and use the correct saucers for the size of pot as it does look so much neater to the eye. I have seen a 9cm pot standing on a saucer meant for a 15.5cm which so detracts from the beauty of the plant. Name your plants - if you do not know it just write 'unknown' on the entry card instead, at least it shows that you have taken the time to try and do things properly. Make sure the surface is clear of debris: I can give you a tip here as I refresh the surface of the plants that I know will be making the show bench with fresh compost about 3-4 weeks beforehand. It gives the compost a chance to settle down, otherwise if you do it just before a show, compost can go all over the place when a judge picks up a plant. These are areas where more points can be picked up with a little more care and effort. Finally check all plants over as a pest infestation will lead to that plant being taken off the show bench. 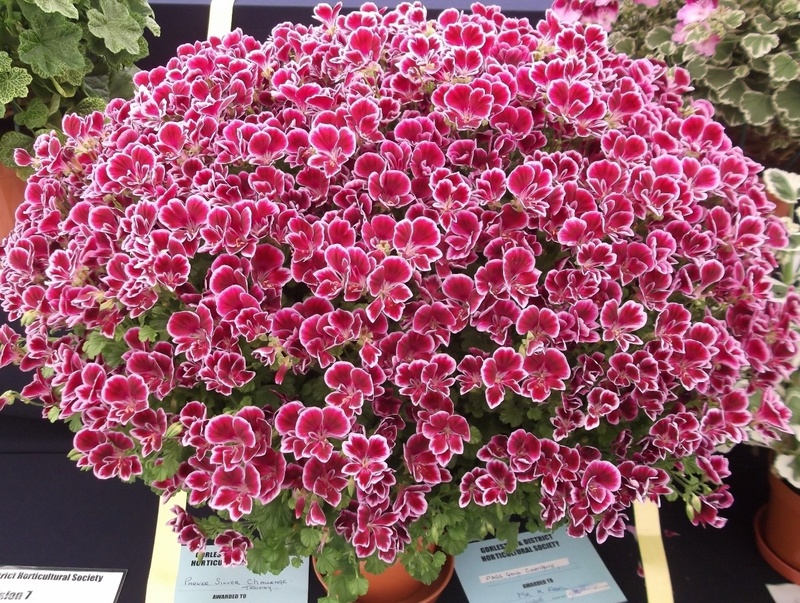 ANGEL BERKSWELL FIESTA GOT BEST PELARGONIUM AND OVERALL BEST EXHIBIT IN SHOW MAINLY BECAUSE OF ITS SIZE AND VAST AMOUNT OF BLOOM. MINIATURE ZONAL BOLD PIXIE WINNING ITS CLASS BECAUSE THE FOLIAGE WAS UNDER THE MAXIMUM HEIGHT OF 5" AND THE AMOUNT OF FLOWERS IT HAD. 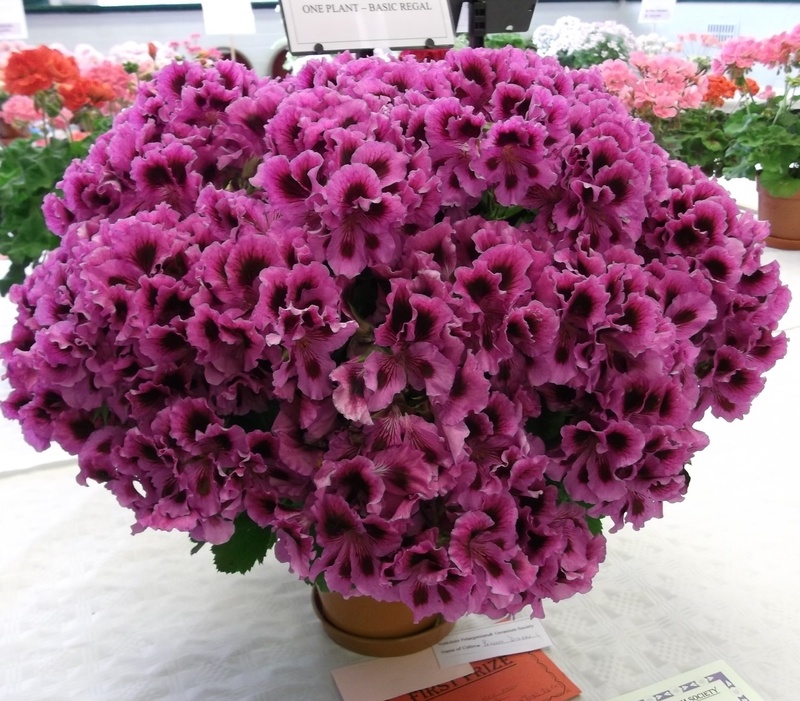 REGAL 'PENNY DIXON'- BEST IN SHOW AT YORKSHIRE DUE TO THE COMPACT SHAPE AND OVERALL COVERAGE OF BLOOM. MINIATURE STELLAR KELLY BROUGHAM - THIS DOES WELL AS IT IS SO COMPACT AND FLORIFEROUS WHICH ALLOWS IT TO STAND OUT WELL ON THE SHOW BENCH. BASIC STELLAR BIRDBUSH CHLOE GROWN IN A 6" POT. IT KEEPS SUCH A GOOD SHAPE, THE LEAF HAS A NICE ZONE AND THE FLOWER HAS THAT WOW FACTOR. ONE YEAR OLD PLANT OF TINKER'S BLOSSOM WON BY HAVING A NICE COMPACT GROWTH AND THE FOLIAGE WAS UNDER THE MAXIMUM HEIGHT OF 7" WITH A GOOD COVERING OF FLOWER HEADS FOR ITS AGE.